Developer, in second trip to Landmarks, altered materials and reduced massing of proposed development adjacent to the Whitney Museum. On February 14, 2012, Landmarks considered Daniel E. Straus’s revised proposal to redevelop eight buildings adjacent to the Whitney Museum in the Upper East Side Historic District. The plan would impact six row-houses at 933 to 943 Madison Avenue and two townhouses at 31 and 33 East 74th Street. Straus acquired the properties from the Whitney in 2010 after the museum abandoned its own plans for the site. In October 2011, Landmarks considered Straus’s original proposal. The Beyer Blinder Belle-designed plan included replacing a no-style row-house abutting the museum along Madison Avenue with a new building and adding a two-story rooftop addition spanning the other five row-houses on the block. Straus planned to replace a small infill building behind 933 Madison Avenue with a nine-story building that would also serve as a rear-extension to an existing four-story townhouse at 31 East 74th Street. Finally, Straus planned to build a one-story rooftop addition to 33 East 74th Street. The project would have been clad in terra-cotta to match the Madison Avenue row-houses. Residents and preservationists opposed to the proposal claimed that it would be out-of-context with the historic district, and wanted a more compelling design. The commissioners objected to the project’s bulk and visibility. 8 CityLand 156 (Nov. 15, 2011). When Straus returned to Landmarks, Beyer Blinder Belle’s Richard Metsky presented the revised plan, which included new materials and simplified massing. The height of the new building proposed along East 74th Street was reduced by seventeen feet. The building would now feature a cornice above its fifth floor to match the cornice height of the adjacent buildings. The building would be clad in beige limestone below the cornice line, and the setback portion above the cornice line would be clad in terra cotta. The building’s top floor would be covered with a matte-gray zinc panels. A setback one-story addition proposed for 33 East 74th Street would also feature the same zinc panels. According to Metsky, the no-style building abutting the Whitney would be replaced with a contemporary version of the neighboring rowhouses. The two-story addition spanning the remaining rowhouses would step back further than the original proposal, but still feature terra-cotta cladding. The project’s street-level visibility was reduced, and Mestky said that only a small portion of the eight-story building would be visible over the top of the rowhouses on Madison Avenue. Metsky noted that the project would return the properties to residential use. Vice Chair Pablo Vengoechea said the project had been improved, but recommended uniting the mix of materials, setbacks, and window patterns. Vengoechea said the project was an ensemble, but should feel like one building. Commissioner Michael Devonshire agreed, finding that the “carnival of materials” detracted from the proposal. 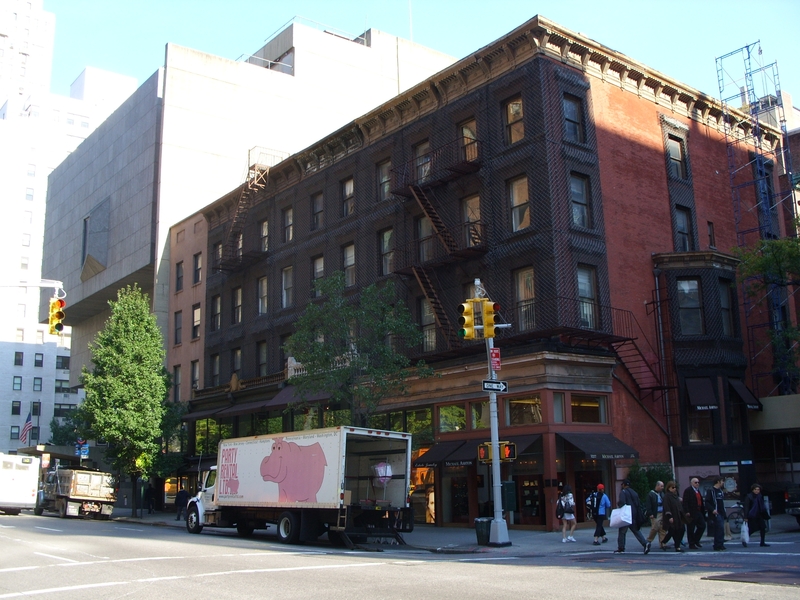 Commissioner Michael Goldblum suggested relocating the massing from East 74th Street to Madison Avenue. Commissioner Joan Gerner viewed the design more favorably, saying it was close to approveable. Commissioners Roberta Washington and Christopher Moore agreed. Chair Robert B. Tierney said the proposal had come a long way, but asked Straus to work with Landmarks’ staff on further revisions. LPC: 933-943 Madison Ave., Manhattan (12-4140) (Feb. 14, 2012) (Architect: Beyer Blinder Belle).